A couple of weeks ago, I was approached by a MotionBased.com employee who asked if I'd be willing to speak to the NY Times about using maps and my GPS unit. I agreed and spoke with Miguel Helft about my experiences with my Garmin Forerunner 305 and various mapping tools, including MotionBased.com (http://cheval.motionbased.com). A week or two later, I was contacted and asked for a photo of myself riding Tanna. I was happy to comply and took off work for a morning to meet Chris Berkey (freelance photographer selected by the NY Times photo editor) at Percy Warner park for a photo session. My husband, Daniel, an avid photographer himself, was pleased to come along and help out. Tanna and I played around, trotting, cantering, galloping, doing figure 8s until Chris decided he had plenty of shots. After the story was bumped a few times, I received a call from Miguel wanting to speak with a map user. 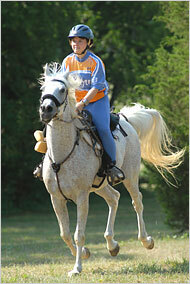 I immediately thought of, and contacted, Angie Fura, the ride manager for the Trace Tribute endurance ride. Angie spoke with Miguel and gave him some good information. The result, the article, With Tools on Web, Amateurs Reshape Mapmaking, was published in the NY Times on Friday, July 27, 2007. Thanks to all involved. I had a great time and got a nice picture of Tanna out of it! This is cool! I found this while looking for historical weather data for a ride site. This will come in very handy when deciding what endurance rides to attend. Weather isn't the biggest factor, but let's face it, endurance riders watch the weather channel more than Martin Crane on the popular sitcom Frasier. For example, here is a sample of the data returned when looking at the weather for zip code 38476, which happens to be the zip code for the Trace Tribute Endurance ride. While it can't predict the weather, it does give you the percentage chance of the weather you might get. I think I will be using this a lot!